Heat oven to 325°F. Lightly grease quiche dish, 9x1 1/2 inches. Mix mushrooms, onion, rice and water in 3-quart saucepan. Heat to boiling; reduce heat. Cover and simmer about 20 minutes, stirring occasionally, until rice is tender. Stir in broccoli and cottage cheese. Stir in remaining ingredients except 1/4 cup Cheddar cheese. Spoon into quiche dish. Bake uncovered 40 minutes. Sprinkle with 1/4 cup Cheddar cheese. Bake 10 to 15 minutes or until center is hot. Let stand 5 minutes before cutting. Tightly cover the unbaked casserole and refrigerate no longer than 24 hours. About 1 1/4 hours before serving, heat your oven to 325°F. Uncover and bake 50 minutes. 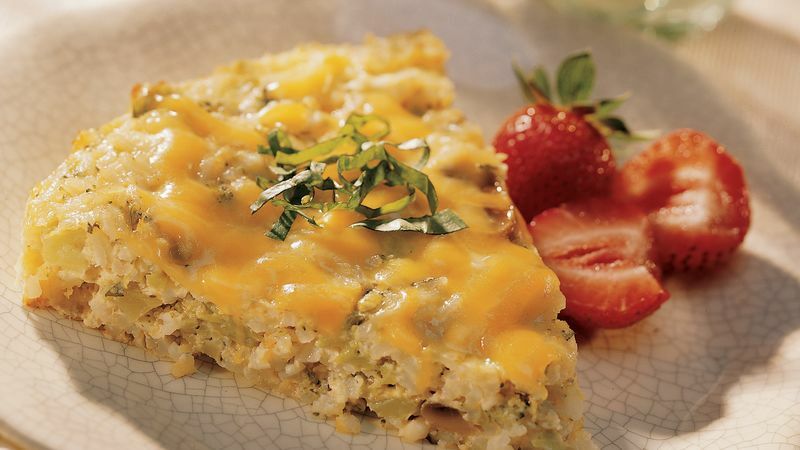 Sprinkle with 1/4 cup Cheddar cheese; bake 10 to 15 minutes longer or until the center is hot. If you don't have a quiche dish, you can use a 9-inch pie plate.